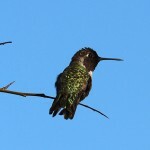 I’ve noticed the activity at the hummingbird feeders has recently dropped off dramatically. Rather than filling the six feeders on a daily basis, I am now filling them every two to three days. 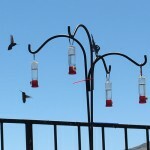 Initially I attributed the decline of the feeder activity to the hummingbirds moving on elsewhere. However, the more I began watching the feeders I noticed that a single male Anna’s Hummingbird was taking it upon himself to chase the other hummingbirds away from the feeders. He is very aggressive and has established three distinct perches created with mathematical precision forming a triangular perimeter to defend his claimed feeding grounds. I am quite impressed, but also somewhat discouraged as I watch the other hummingbirds being chases away from the feeders. 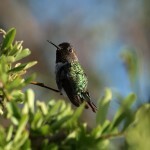 As it turns out I had photographed this hummingbird several times before. He was easy to identify since he is missing several tail feathers. After one of his first photo sessions I named him “forked-tail” (FT). It wasn’t until I started observing the feeders to learn the cause for the diminished feeder activity that I realized FT was the tyrant. 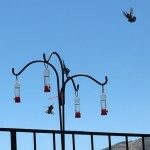 Since FT was around during the heavy feeding activity, I’m still convinced that many of the hummingbirds have departed. 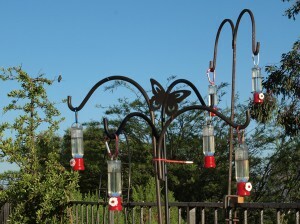 With fewer hummingbirds to deal with it is now just easier for FT to control the feeder activity. 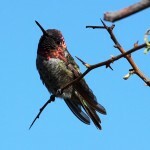 It has been interesting to watch the strategies of the hummingbirds attempting to use the feeders. Some come in low out of the view of FT, while others would come in pairs. As FT gives chase to one the other feeds quickly. FT feeds occasionally in between chase episodes. He seems to be doing a good job of protecting his feeding complex. FT most often gives chase to an incoming hummingbird before it reaches the feeders making it a real challenge to photograph the interactions. There have been several other interesting FT encounters. A Lesser Goldfinch occupied one of FT’s three mathematically placed perches. FT tried without success to chase the goldfinch off the perch by repeatedly diving and hovering over the bird. FT chose one of the other two perches until the goldfinch left. I have not been immune to FT’s aggression. While standing too close to the feeders FT flew over and hovered near my knees, while moving back and forth horizontally in front of me while making repeated clicking calls. Obviously FT is unaware of who is refilling the feeder complex he has claimed as his own. Or perhaps he actually did know who filled the feeders and was just scolding me for not keeping them filled. 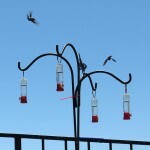 Several of the feeders were empty at the time. I’ve thought about spreading the feeders out making it more difficult for FT to defend them all. Noticing that FT was also chasing hummingbirds off the oriole feeder located some distance away, I realized that would probably not be a satisfactory solution. It is obvious that such aggression and control is not an easy job at all. FT is in constant patrol mode from dusk til dawn daily. Our cat VELCRO has befriended our next door neighbor’s cat KARTER. Our neighbor advised us earlier that KARTER had adopted them not visa-versa. They warned us that we should not let KARTER in our house or he would adopt us as well. 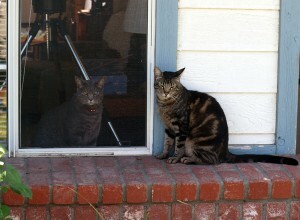 VELCRO and KARTER have been meeting on a daily basis now through screened windows or doors. 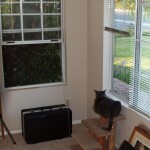 They usually meet nose to nose at the front window with KARTER on the brick ledge and VELCRO inside looking out. Recently other neighborhood cats have been showing up to visit VELCRO but usually stay below the brick ledge of the front window. Several days ago I heard VELCRO making a tender “cooing” meow and went to see what was claiming his attention. Looking up at VELCRO from below the brick ledge was a beautiful black cat with green eyes. Hmm, I thought surely it must be a female cat based on the way VELCRO was acting. 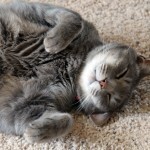 Of course, VELCRO being neutered, declawed (he was a rescue cat), and an indoor cat . . . . unfortunately for VELCRO, only in his dreams. Last evening I noticed VELCRO and KARTER were engaging each other but KARTER was staring out away from VELCRO and VELCRO was looking intently out the side window. I approached VELCRO and began to pet him when he started hissing and growling while intently looking down out the window. Through the bushes I noticed an orange cat, then another. Out the front window two more cats arrived slowly walking across the grass heading towards KARTER and VELCRO. It was an amazing assemblage occurring all at the same time – like a scene from the movie Eclipse. All the time KARTER sat at the edge of the brick ledge overlooking the cats as they assembled on the yard below him. It was as if KARTER had called for the meeting to introduce VELCRO to the other neighborhood cats, or more likely to show off his harem and subjects to VELCRO. KARTER was also probably advising VELCRO to quit cooing with his green-eyed black cat lady friend. She was not present at this gathering. ". . Oh, those green eyes!" I imagine keeping all the neighborhood cats in line is no easy task either. It is apparent that KARTER is the Top Cat in the neighborhood as we expected him to be the first time we met him. Now he’s proven it! * STONEHURST is the housing development in Wildomar, CA where our home is located.